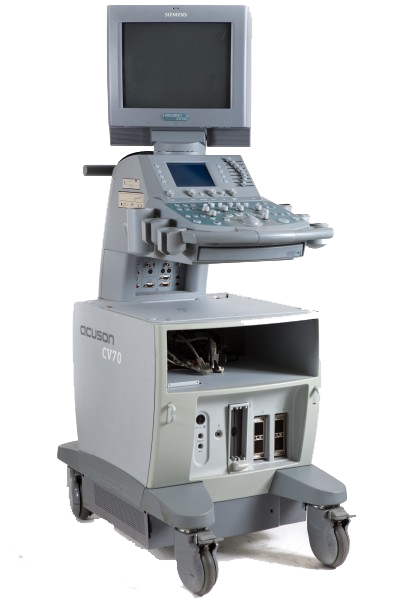 The Acuson CV70 cardiovascular ultrasound is a powerful, portable multi-specialty imaging platform that incorporates the latest generation of ultrasound technologies. Some of this all-digital ultrasound’s most prominent features include its exceptional image quality, Doppler sensitivity, color flow sensitivity, and spatial resolution. With ultra-sensitive, wideband transducers matched with user-selectable MultiHertz imaging, the Acuson CV70 also improves image resolution and penetration, creating the highest quality images for your applications.